so, not to brag or anything, but my parents have the best yard in Ann Arbor. with a large grassy area, woods, stream, hammock, and 200 year old oak tree with a tire swing over the pond it's kid heaven. y sisters and I had lots of forts in the woods over the years, but never a tree house. so when my sister Sammie said she was going to have one built for maya and neela I knew I had to make something for it, but what? 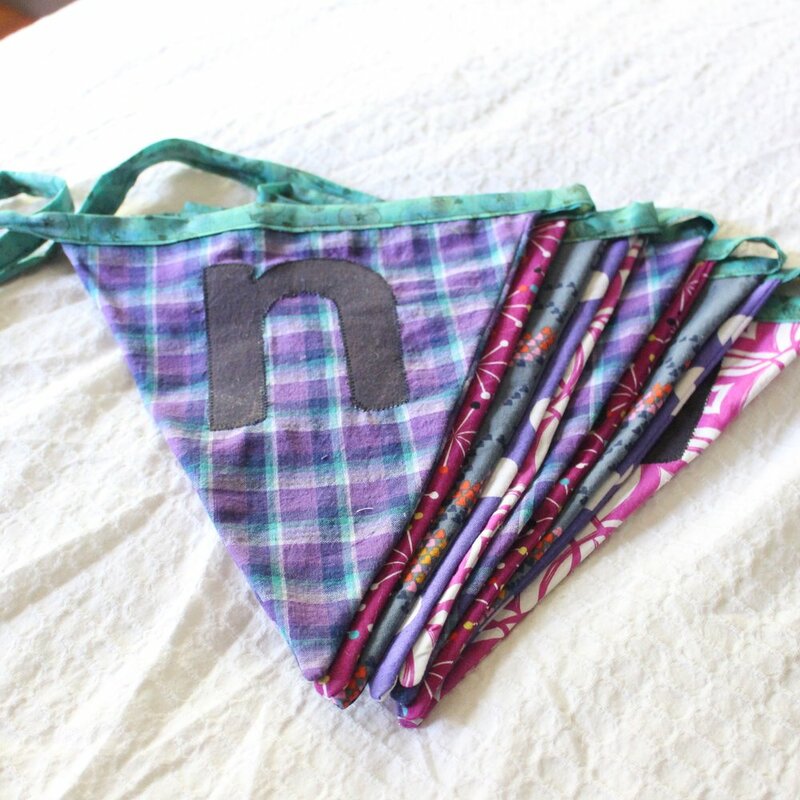 unlike my earlier bunting projects (here and here) i switched it up for this one and made triangle pennants. i also made it include both girls names, it reads "maya ❤️ neela" on one side and "neela ❤️ maya" on the other. the purple plaid i got from the east bay creative reuse center. the magenta sparkle print was from britex, and used to make maya her sparkler dress and neela a matching top. the bee print was a gift from vic's aunt and uncle, and left over from Nora and Etta's mash up dresses and neela's float like a butterfly, sting like a bee top. the purple polka dot was leftover from Nora and etta's twirly dresses and a class picnic tunic for maya. the magenta swirls, originally from stonemountain & daughter, was left over from the mommy and me top and scarf and a swirly swingset skirt. the letters were from a chambray i got a while back at stonemountain & daughter, with the intention of making myself a lisette traveler dress. finally i used some pretty special fabric, liberty of london apples print originally from gather here for maya's peacock dress three years ago, for the bias tape binding. just as I thought the girls love the bunting and love their treehouse! they even wanted to bring teeka bear up!